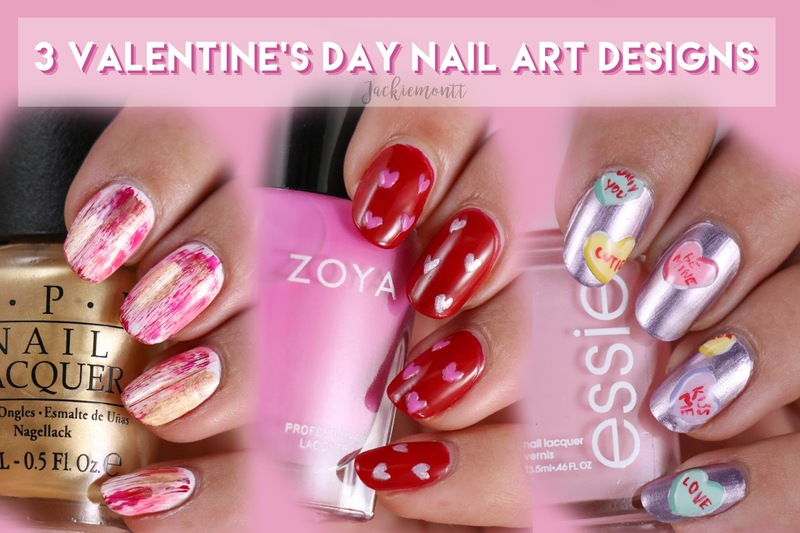 Valentine's Day is just two weeks away, and I wanted to get some nail art ideas out there for all of you! 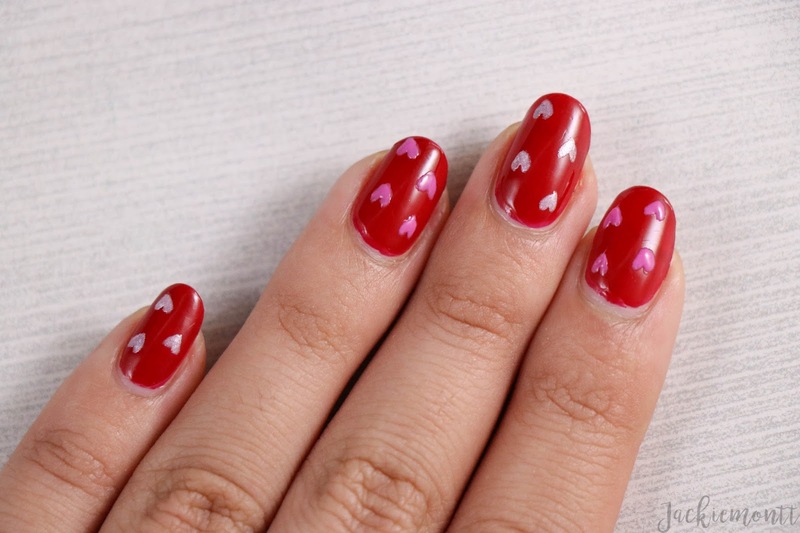 Keep reading for three different Valentine's Day nail art designs. 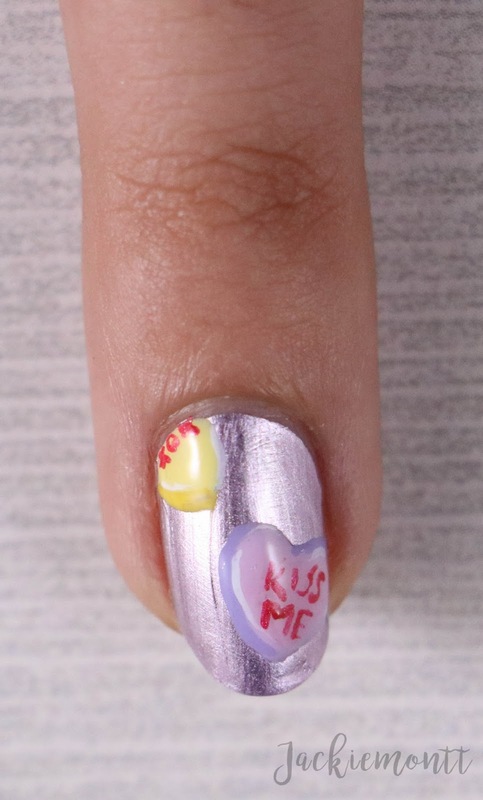 Today I have three super cute Valentine's Day nail art designs and ideas for anyone and everyone, no matter your experience level! 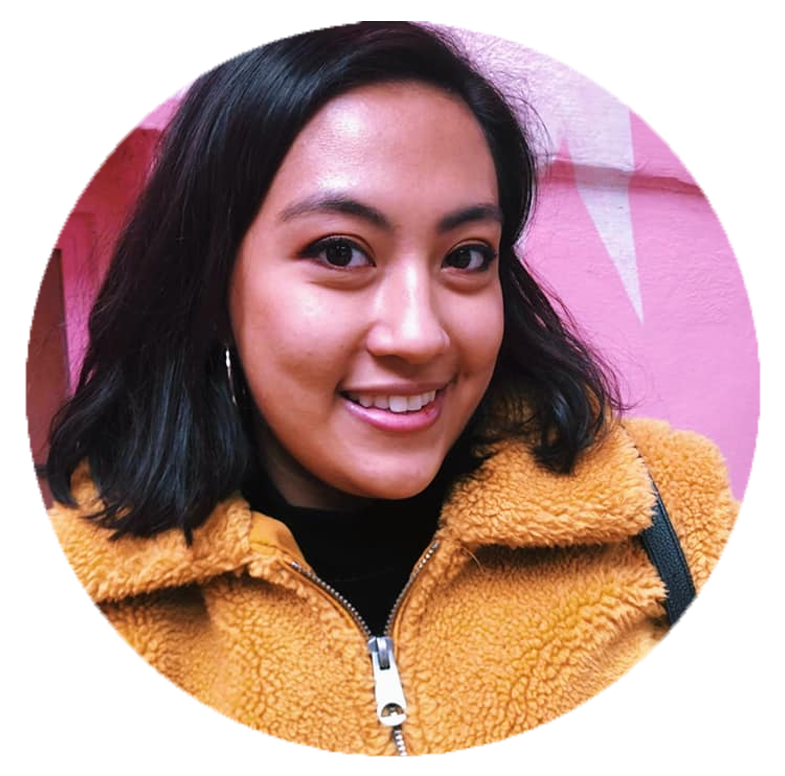 When I was starting out with nail art, I always found even the "easy" nail art I would look up would require some sort of tools that I didn't already own, so I really wanted to be sure that my easy look was doable for everyone -- no tools needed. I have to say, I love how cute and sophisticated all of these turned out, and I hope that some of you guys recreate these looks! 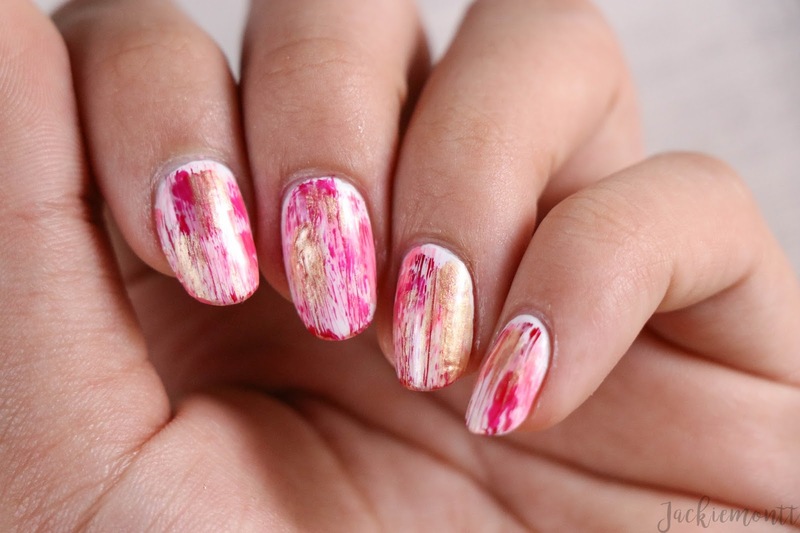 The first look I have for you is a super simple, dry-brush nail art design. To recreate this look, all you need is a couple of colors in the pink to red range, and then a nice gold to top it all off with some shimmer. I started out with a white base and then went in with the dry brush technique. First I used a medium pink, then went in with the red, then a light pink, and tied it all together with the gold for really nice shine on the top layer. There is no right or wrong way to put this look together, so feel free to play around! 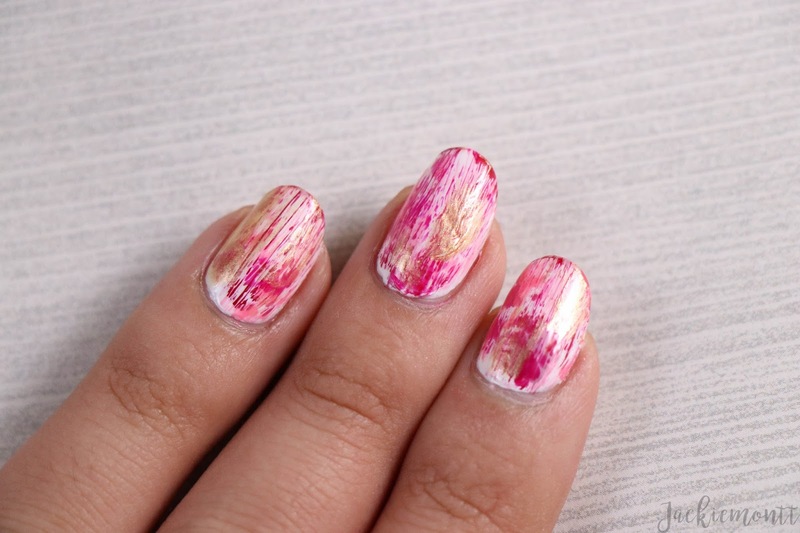 If you don't know how to create a dry brush nail art look, all you have to do is wipe off your brush until there is almost no polish left on it, and then drag it in a downward motion on the nails. The second look is for those of you who are trying to step out of your comfort zones and start using nail art brushes. 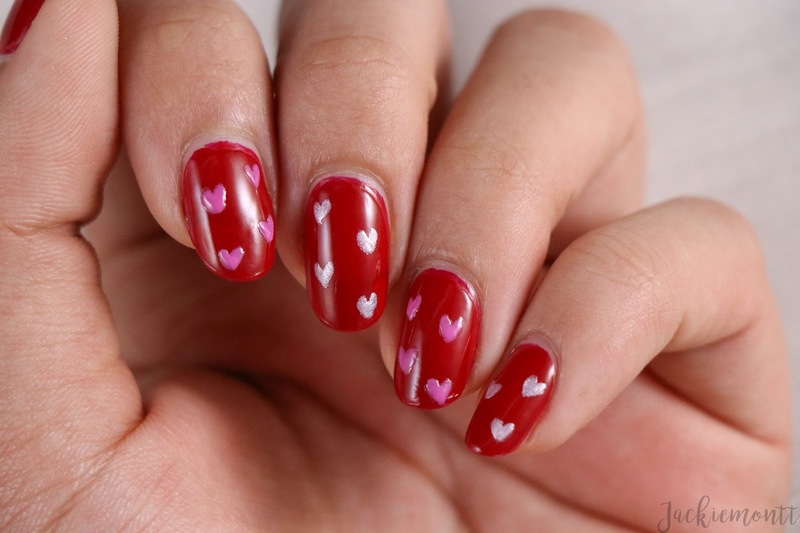 Here I have a super cute mini-heart mani. 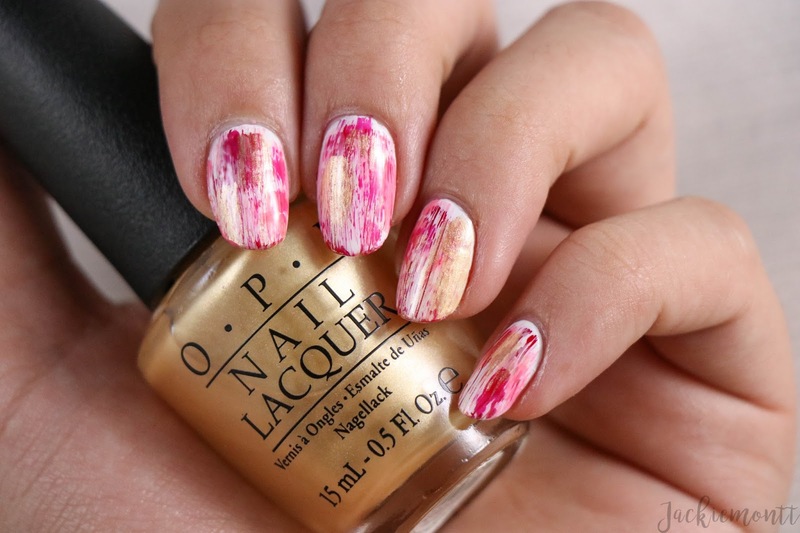 This is also a super simple nail art design, but does require a fine tipped brush and a bit of coordination. 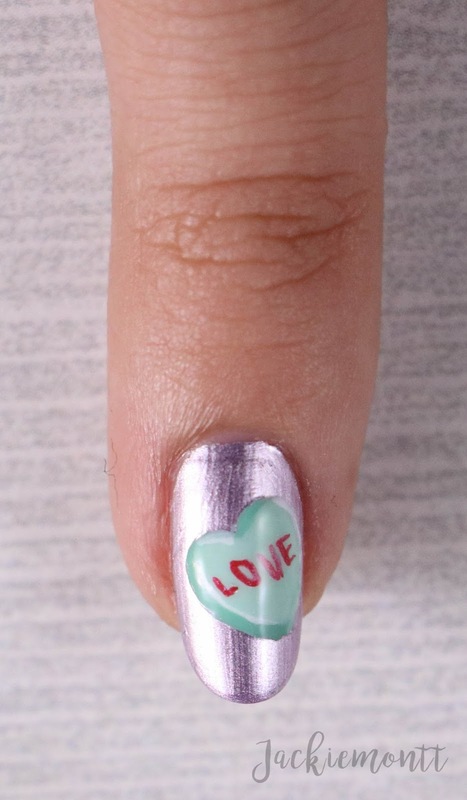 I started out with a red jelly base, and once that was dry I took a frosty pink (that looks more silver in the pictures) and started to paint tiny little hearts on every other finger. I then went on the opposite fingers and painted on tiny medium pink hearts. This will take a little bit of practice to get the heart shapes to all look the way you want. I suggest practicing on a piece of paper before going right onto the nails. 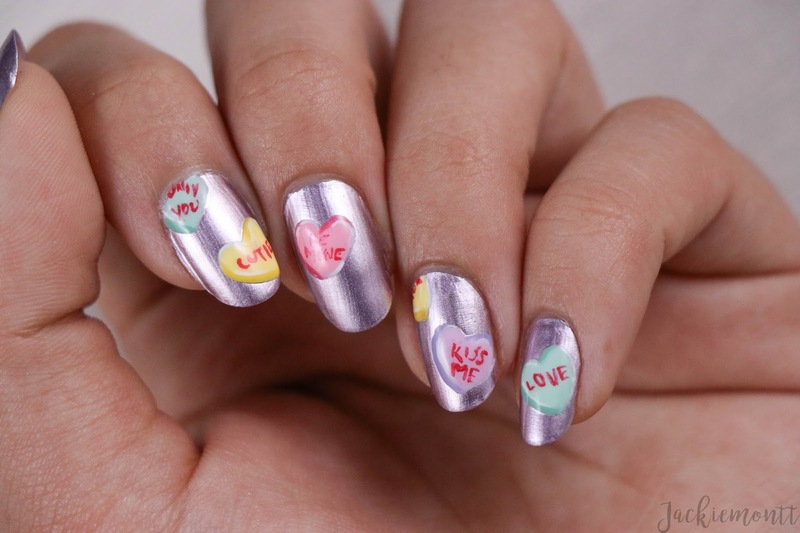 Last, but certainly not least, is this super adorable Candy Heart Valentine's Day nail art. 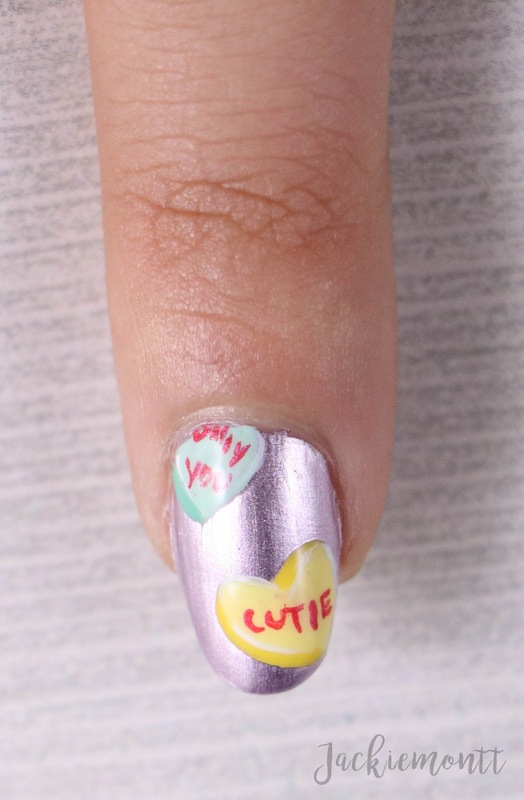 I was so obsessed with these candy hearts as a kid, and I knew I wanted to bring them to life on my nails this Valentine's day. I am so in love with these nails, I could stare at them all day! 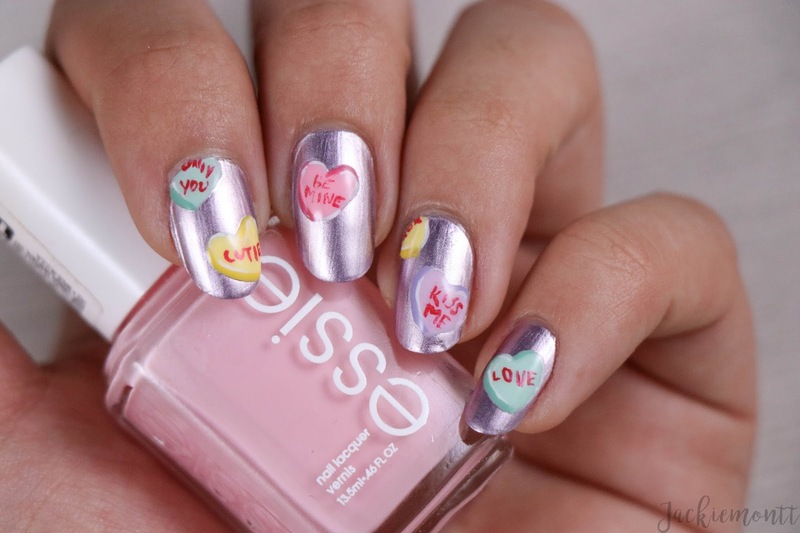 I started this look with a pink/purple metallic base, and then went in with each of the pastel colors to create the base of each heart. I then went in with a slightly darker tone of each shade. I personally had each color as an individual polish, but if you don't -- you can mix a little white polish in with each color to create a lightened version, and then use the polish right out of the bottle as the "shadow" shade. Lastly, I went in with acrylic paints to add the text, and a couple white highlights. This look is not for the faint of heart, but if you want to give it a shot I would love to see all your recreations! 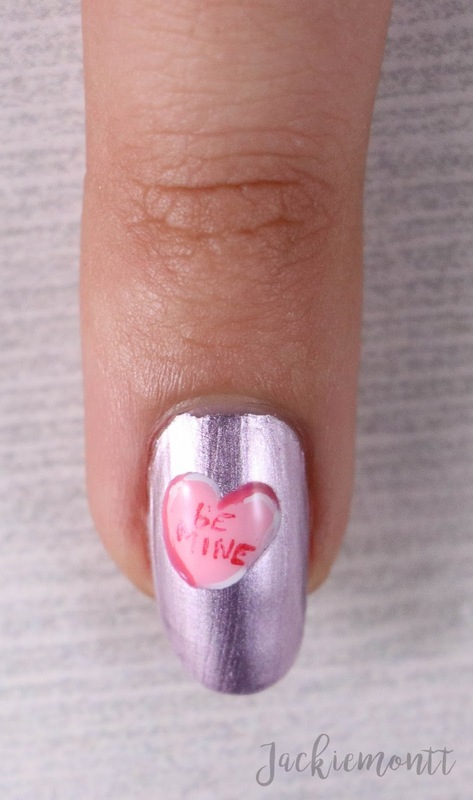 I used a small detail brush from Michaels Craft Store to draw on the hearts and all their details, but you can always use nail art brushes as well. I hope that these nails have inspired you, but always remember nail art, as with everything, practice makes perfect! I by no means could have created this final look a couple years ago -- so if you want to make it there just keep practicing! Make sure the you top off each of these looks with a top coat to seal your beautiful designs in. If you recreate any of these looks please tag me @jackiemonttblog and used #jackiemonttnails !